Bryan Clauson, the 27 year old racer from of the Indianapolis suburb Noblesville, who captured the attention of the nation by embarking on his “Circular Insanity Tour,” died from injuries sustained in a crash while leading the USAC Belleville Midget Nationals in Kansas on Saturday night. 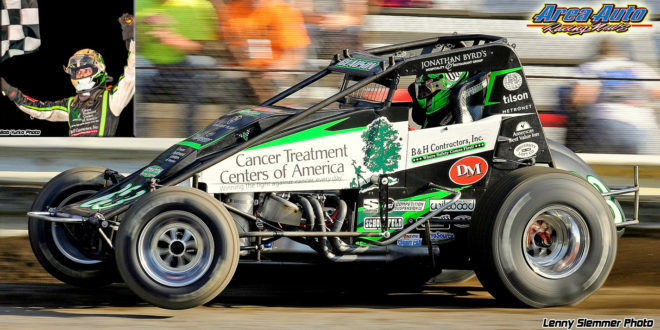 Clauson had been severely injured in a multi-car crash, his family announced his passing Monday morning. Clauson had just taken the lead from Chad Boat and was starting to pull away from the field when he encountered lapped traffic on the lightning-quick half-mile dirt track. Clauson tangled with a lapped car, slammed into the outside fence, and went into a series of end over end flips before landing on his side. At that point, he was struck in the cockpit by an oncoming car, driven by Ryan Greth. Race track safety crews removed Clauson from the vehicle before airlifting him to Bryan Medical Center West in Lincoln, Nebraska for treatment through Sunday night. Initial reports from the family via Facebook listed the driver as having been “severely injured” and in critical condition. He was surrounded by family and friends at the time of his death. The Clauson family released a statement. “Last night, the 7th of August, we said goodbye to our son, my fiancé, our friend, Bryan Clauson. He was surrounded by family and friends and we were grateful that we could experience his final moments with him. 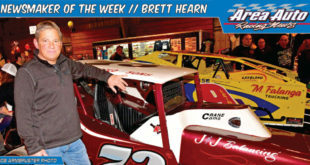 “Our Bryan fought to the end with the same desire that he demonstrated behind the wheel of all the various race cars he would park in victory lane. However, we were more proud of our Bryan that took a moment to make a young fan’s day, or demonstrated his uncommon kindness and appreciation toward his friends, family and fans. “We know that our Bryan is also your Bryan and that you would like to participate in honoring him. Clauson had recently joined Tony Stewart in making laps around a temporary dirt track erected at Indianapolis Motor Speedway inside turn three of the famed oval. 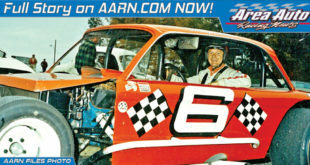 The fallen ace was attempting to win his fourth career Belleville Nationals, and second consecutive at the track. He was just beyond the midpoint in his “Chasing 200 Tour, Circular Insanity”. Clauson was planning to race in an unheard of 200 races this year. 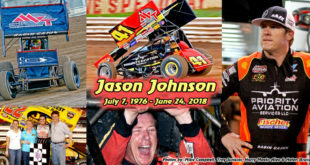 The Belleville Nationals was the 116th event he had run in during the tour, which included stops at the Indianapolis Speedway for the Indy 500, World of Outlaws and All Star Circuit of Champions winged sprint car events, USAC midget and sprint car events and wingless events as well. 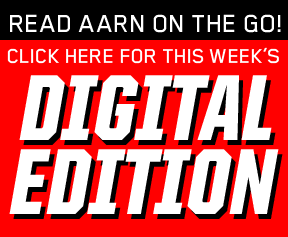 In an interview with AARN Editor/ Publisher Len Sammons that ran in AARN’s July 5, 2016 edition, Clauson talked about his goal of 200 races. At the time of his death, Clauson had won 27 of the 116 races, a winning percentage of 23 percent. Fourteen of those were non-winged 410 Sprint cars, five midgets, four in non-winged 360 Sprint cars, three in winged 360 Sprints and one in a winged 410 Sprint. 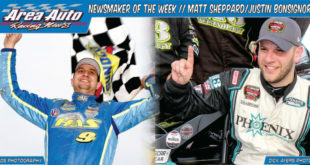 He also won the Indiana Midget Week and the Eastern Storm USAC Sprint championship. 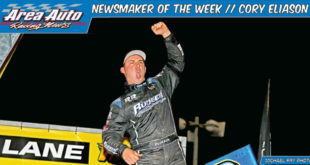 He had walked away from a nasty crash in Friday night’s preliminary race and tweeted his thanks to Simpson Racing and Spike Chassis for having left him uninjured. Tributes and remembrances flowed freely from a reeling racing community. Area Auto Racing News writer Mark McKeon, who extensively covered races in which Clauson competed, admired the driver’ grace and intellect. “He really was a great representative for racing and his popularity spanned generations. I interviewed and spoke with him several times and he was always both thoughtful and articulate. Area Auto Racing News columnist Mark Tiderman reflected. Deb Smith, AARN writer, spent time covering races on the 2016 USAC Eastern Storm circuit in which Clauson was a key player. “Everyone has Bryan Clauson stories to tell because he touched the lives of everyone. If you were a member of the press or a fan, Bryan Clauson took the time to answer your questions or sign an autograph. “My favorite Bryan Clauson memory came at this year’s Chili Bowl when he went out on the track to catch the winner, Rico Abreu, when Rico jumped from the top of his roll cage in Victory Lane,” Smith said. Veteran AARN photographer Lenny Slemmer. Jr. mourns the loss of Clauson. Nationally, organizations and track officials struggled to come to grips with Clauson’s sudden passing. “NASCAR extends its sincere condolences to the family and friends of Bryan Clauson, a passionate competitor whose love for racing fueled his unmatched positive spirit. He was a dear friend to many in the racing community, and he was loved and respected by all who knew him. He touched the lives of so many in our motorsports family,” offered Steve O’Donnell, NASCAR Executive Vice President and Chief Racing Development Officer. Chris Blair, Gateway Motorsports Park Executive Vice President & General Manager, held Clauson in highest regard. 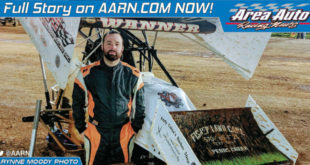 “Bryan was a winner at Gateway Motorsports Park and we were looking forward to seeing him in action again on our oval. “Earlier this year Bryan and his fiancée Lauren Stewart became promoters and we were proud of their success in packing the event center at DuQuoin for an indoor event. Brady Bacon, a peer of Clauson’s, eulogized his collegue. “I’m heartbroken over the loss of Bryan. His love and dedication to the sport is unrivaled. “More importantly he was truly a great person and friend. Tim and Di should be extremely proud of the wonderful man they raised. “I cannot begin to imagine the pain his family is enduring. At Knoxville Raceway, where Clauson was entered for this week’s Knoxville Nationals, a makeshift memorial developed at the site where the Clauson team race hauler was parked. 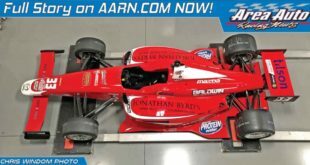 Clauson had told AARN’s Sammons that the ‘Circular Insanity Tour’ was a self-imposed personal challenge and hinted that it would not likely be repeated. “This is all about challenging myself, not only physically but mentally too, he said. “Jumping in and out of cars and racing different types of cars. It’s tough to do and I didn’t know if things would ever align that I would have the chance to do this. Unfortunately, the end came prematurely.